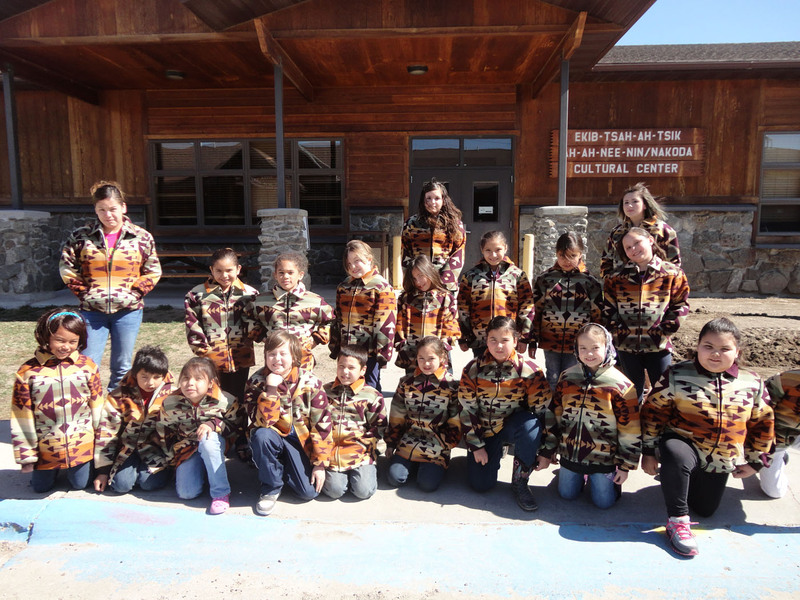 Twenty-three scholars at the White Clay Language Immersion School worked hard for their new school uniforms: coats made of Pendleton’s “Big Thunder” wool. Students and their parents fundraised with bake sales, raffles and silent auctions. They didn’t just buy the fabric; students actually helped design and sew the coats. The White Clay Immersion school was founded in 2003 under the guidance and direction of Dr. Lynette Chandler. It’s located in the Aaniiih Nakoda (Fort Belknap) College Cultural Center in Harlem, Montana. The school’s mission is to revitalize the White Clay language. Dr. Chandler is an enrolled member of the A´aninin tribe. She has helped raise the amount of White Clay speakers from only eight to several hundred, bringing the language back from the edge of extinction. For the students, the advantages are more than cultural. Students who learn their daily lessons in White Clay test high on standardized tests, due to the demands of learning a complex language. This year, Dr. Chandler was selected as the Indian Educator of the year by the Montana Indian Education Association. Her inspiring story can be read here in “Circle of Hope,” the bulletin of the American Indian College Fund. The story is just as clearly read in the proud faces of her young scholars.